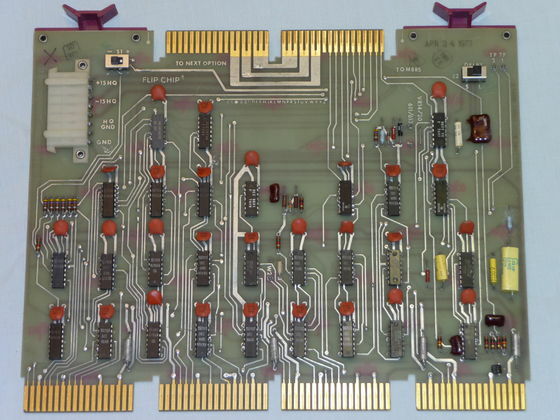 This is the front of the M869 point plot display control board. It is used with the M885 (100K) point plot display D/A board to drive X/Y monitors like the VR14 monitor. The switch in the upper right select between 6 microseconds (us) for fast displays (Tektronix scopes) and 20 us for slow displays (VR14). The switch in the upper left selects between negative and positive intensity pulses. The connector on the left side of the board is for the +-15 VDC high quality (low noise, stable output) power supply.